Valentine's song perfect for Valentine's Day or other romantic occasions. David Hare’s music is contemporary yet timeless. Valentine's Day is a single not currently available on an album. Also check out David's CD DEMONSTRATION that is packed with original songs that combine lasting lyrics, memorable melodies, coupled with harmonious chords that appeal to a wide audience. 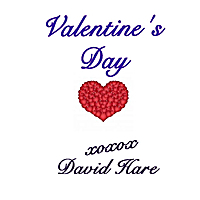 David Hare is a guitar-playing singer and songwriter based in the United States. His sound blends rock, alternative, and progressive folk styles. David Hare brings honesty and depth to his work. Hare loves to perform and is looking forward to sharing his music with everyone.